Did the Kimbell Museum acquire a Michelangelo ? 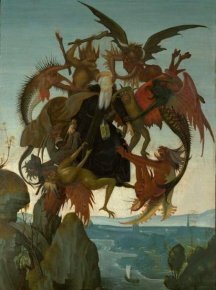 14/5/09 – Acquisition – Fort Worth, Kimbell Art Museum – When he was twelve or thirteen, Michelangelo who was then in Domenico Ghirlandaio’s workshop, had painted a copy of Martin Schongauer’s engraving The Temptation of Saint Anthony on a panel. This anecdote is recounted both by Vasari in his Vite and Ascanio Condivi in his Vita di Michelangelo Buonarroti published in 1553. This first work reported in texts has sometimes been identified with a painting that has been followed for almost two hundred years. It has a prestigious historical background : it was part of the collection belonging to the sculptor Henri de Triqueti, appeared at auction after his daughter’s death where it remained unsold. Donated to Sir Paul Harvey before 1905, it stayed in his family and once again failed to sell in 1960 under the name of Michelangelo. This panel, which has often been published, was sold last 9 July at Sotheby’s London as “workshop of Domenico Ghirlandaio” and acquired by the art dealer Adam Williams before it was finally turned over to the Kimbell Art Museum in Fort Worth as a Michelangelo. The Metropolitan Museum, which restored it, wished to acquire it but could not raise the needed funds given the current financial crisis . X-ray studies showed several “repentirs” (repaintings or second thoughts by the master himself) thus proof, according to its supporters, of Michelangelo’s own hand. There is no doubt, however, that this attribution will continue to raise heated debates. This is not really a rediscovery but a disputed work which a discriminating dealer believes to be authentic, along with several specialists including the curators at the Metropolitan Museum (Keith Christiansen and Everett Fahy). Other art historians do not acknowledge it (Cristina Acidini, Paul Joannides…). The panel will be highlighted in a special exhibition this summer at the Metropolitan Museum before its permanent presentation in Fort Worth. Let us point at the same time that another work which was recently attributed to Michelangelo and acquired by the Bargello, a Crucifix (see news item of 4/1/09), is currently at the heart of a controversy in Italy . The authenticity of the sculpture is disputed and several authoritative voices have spoken out against the very high price that the Italian government has spent to acquire it, claiming it is a maneuver by Silvio Berlusconi. Having already extensively dilapidated public funds for an uncertain work, while imposing drastic budget cuts on the Italian patrimony, the head of the government is using this Christ on the cross which is being exhibited all over the country as an instrument of political and religious propaganda. The painting sold for 1.2 million pounds ; the purchase price paid by the Kimbell Museum has not been disclosed. See particularly the New York Times article of 21/4/09 :Yes, It’s Beautiful, the Italians All Say, but Is It a Michelangelo ?.